First of all, Labor side should be commended for its employment story during its term in office (2007-2013) where 955,200 jobs were created. Saying that one of my key criticisms of the then Employment Minister, Bill Shorten was that the spotlight was always on total job creation rather than looking at full-time and part-time job breakdowns. During the Labor years 450,400 part-time jobs were created against 504,800 full-time ones. Currently, there is a lot of discussion in Australia around employment and unemployment at the moment. In the past month many companies have announced large job cuts either in the immediate or near future. Recent examples with direct jobs lost include Holden (2,900), Toyota (2,500), Forge (1,400), Rio Tinto (1,100), Qantas (1,000), Electrolux (544) and just today Alcoa (980). The seasonally adjusted unemployment rate hit 6% for the first time since July 2003 (when it peaked at 6.1%). The RBA is has for some months forecast that the unemployment rate would hit 6.25% during 2014, then steadily improve from 2015. That view remained unchanged in its most recent Economic Outlook. Thus it would be unfair to immediately thrust blame on to Tony Abbott and the recently elected Coalition government as many in the opposition camp are doing. To that end I thought I might shine a light on the Abbott promise. 1-million jobs in five years. Here is a look at the data for the first four months to January 2014. The sample size is way too small to start analysing and unemployment figures from the ABS are generally considered a lagging indicator. 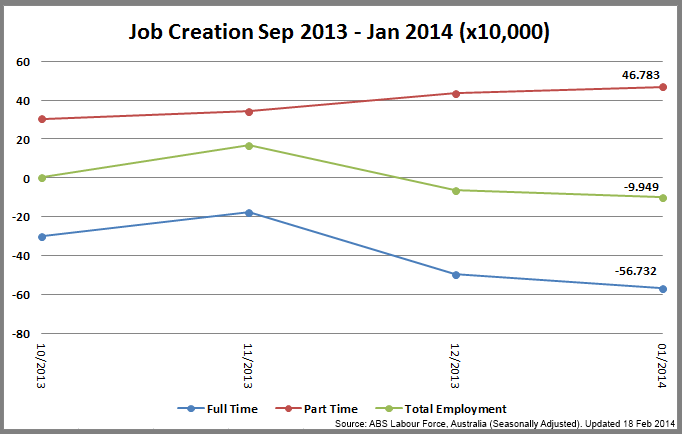 Second and last chart looks at job creation in three parts. Total job creation (green), full-time employment (blue) and part-time employment (maroon). In effect there have been 56-thousand full-time jobs lost against 46-thousand part-time jobs gained for a gross loss of 9,949 jobs. Bill Shorten’s recent commentary around 54,000 job losses (or one job every three minutes) might make a good sound grab but actually only reflects full-time employment losses over a very short timeframe. I think it’s disingenuous of him as the former Minister to use total employment figures then but now only concentrate on one set of numbers. That aside I wonder if the RBA has underestimated the unemployment nadir at 6.25% which will make it much harder for Tony Abbott to hit his 1-million jobs in five years promise. Only time will tell. I’ll keep you updated. The Manufacturing Workforce Planning Scan is a quasi-quantitative report card built from relevant online industry magazines and media sources. Utilising 15 category metrics the scan collates relevant stories over a period of time (in this case a Financial Year) to give a picture of how the industry is positioned from a workforce planning perspective. Before we look at the last 12-months of Workforce Planning data I thought it might be useful to look at the previous two decades of manufacturing employment and three possible future scenarios over the coming decade. In 1976 Australia had approximately 1.7-million manufacturing workers, by 1994 this had reduced to 1.12-million and in February of 2013 this had reduced further to just 954,200. In the graph above the 1994-2013 data is represented by a black line (corresponding with ABS yearly averaging through to 2012 then SkillsInfo data as at Feb 2013. The SkillsInfo data parallels with the very early election timeframe as put forward by Julia Gillard, the previous Prime Minister). Scenario One: The blue line shows an increase in manufacturing employment of 95,420 over a period of 10-years is a highly optimistic variant and goes against a four decade trend. Some of the reasons why this scenario is unlikely include continued off-shoring of Australian manufacturing, increased productivity without increased employment through Automation/Augmentation take-up and a continued slow decline in family business manufacturing. Scenario Two: The green line shows a continued decrease of manufacturing employment by 8,375 per annum which is the 20-year average of atrophy in the manufacturing sector. “If you go back to 1976, that figure was around about 1.7 million so over a quarter of a century we have gone from 1.7 to under a million and in 10, 15 or even 20 years’ time, we’ll still be making stuff but we might not need 980,000 workers,” Salt says. “We might only have 600,000 workers and we might be making bricks and beer, stuff that’s too hard to bring in from overseas at an effective rate, or it might be high tech products that only the Australian market can make. 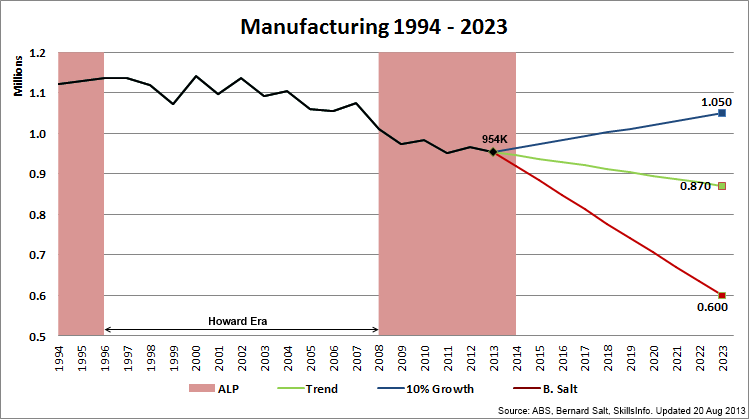 In all fairness to Bernard he didn’t put a timeline on the reduction to 600,000 but it would be my guess that by 2023 the number of Australian’s employed in manufacturing will be somewhere between the green and red lines with a weighting toward the red line. Here are the manufacturing analytics from financial year 2012 – 2013. The following chart is 12-month look at 15 manufacturing related workforce planning categories and the amount of times it features as a story. Employment was the leading category for eleven months of FY 2012-2013 with 203-stories and a monthly average of 33.6%, slightly more than 1/3rd of all stories with relevance to workforce planning. With the constant atrophy of employment in the sector the weighting should have been greater (and more negative) but I believe there is an element of job-loss fatigue in terms of a sector theme. IR (Industrial Relations) was the only other category to be a leading indicator, with 14-stories (31.1%) in August 2012. This corresponded with commentary on the Fair Work Australia and manufacturing reviews and strikes at BlueScope Steel, Volgren, Forgacs and ongoing tension with the Grocon development in Melbourne. WH&S (Work Health & Safety) was another leading indicator, finishing as the second leading indicator six-times and in the top-3 on eight occasions. With all the emphasis on safety within Australia it’s often forgotten how dangerous a lot of manual, repetitive manufacturing work is. During the FY 2012-2013 period there were 1,302 deaths and 954 injuries reported including seven deaths in Australia. The most notable (and horrific) was the collapse of the Bangladeshi factory which killed at least 1,129. The next chart is a 12-month look at 15 manufacturing related workforce planning categories and their positive or negative weighting. Employment was the most negative sentiment for FY 2012-2013. Officially the decrease in manufacturing employment was just negative 0.3% for the period Feb 2012 – Feb 2013 and negative 1.6% over the past two years. The sentiment of stories that I’ve reviewed and the recorded job losses against job gains both paint a slightly darker picture. On a more positive note L&D/R&D, which measures both Learning & Development and Research & Development indicators was the most consistently positive with 59-stories and a monthly content average of 10% it had the highest sentiment on seven occasions. One of the positive themes behind Australian manufacturing is that although it is under immense pressure there is a lot of good news in terms of adjusting the workforce for its new challenges and in developing new solutions for modern manufacturing. It probably should also be noted that I state ‘good news’ in terms of L&D/R&D outcomes rather than ‘effective news’, a much more difficult proposition. Engagement, which looks at everything from engagement at the worksite through to industry engagement to promote employment had the highest sentiment reading for FY 2012/2013 with a +9 recorded in May 2013. This corresponded with the National Manufacturers Week and the Endeavour Awards and is a good indicator that these two events raise awareness of manufacturing. The following table looks at the reported employment gains and losses. Reported job losses are actuals as reported by manufacturing industry sources but often do not reflect the total loss of employment as some companies choose to limit the amount of information in relation to redundancies. Employment gains are forecast only. . Often employment gains are overstated as they link to public relations exercises. For every forecast job announced in manufacturing for the period July 2012 through to June 2013 there were approximately 9-times the amount reported lost. A bellwether story for manufacturing over the past year is the Gladstone’s Boulder Steel project. Announced with great fanfare in November 2012 forecasting 3,800 jobs (2,000 construction plus 1,800 operational FTE’s) it was quietly shelved when the company went into administration just eight months later. The overall theme behind FY 2012-2013 has been one of continued slow atrophy. The biggest development of the year, that of Boulder Steel was announced and shelved within a couple of quarters even as the Australian dollar came down of a very long high. This was a big story and a ‘nothing ventured, nothing gained’ outcome. Outside of Boral which cut more than 1,000 during the FY and Ford which will close down in 2016 with the loss of 1,200 FTE positions most companies reported losses in the scores and hundreds. All of this added up to a number greater than 11,600 and that’s just the reported count, not all the SME’s who are quietly cutting in the background out of the public eye. I’ve talked and written often on peak employment but when it comes to manufacturing in Australia that is a moot argument (especially given the peak period of Australian manufacturing was four decades past us). As Q1 FY 2013-2014 starts off with an election and an ideological battle between political parties over the fate of automotive manufacturing in Australia the real question will be where will be floor level of manufacturing employment be in Australia? 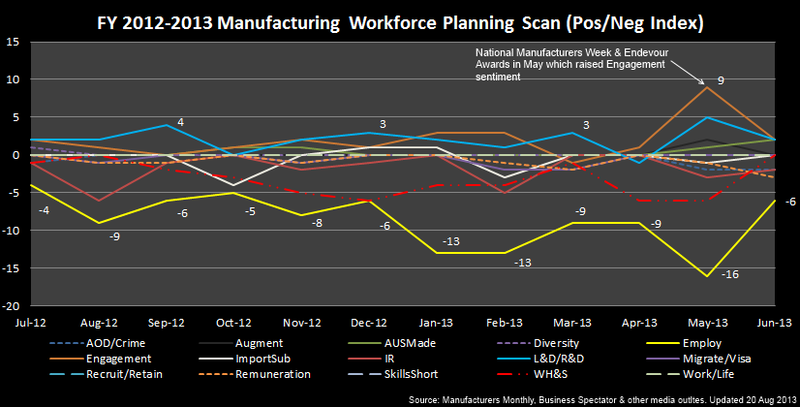 Acknowledgements: Although not the only sources utilised the Manufacturing Workforce Planning Scan’s primary data sources include Manufacturing Monthly and Business Spectator. 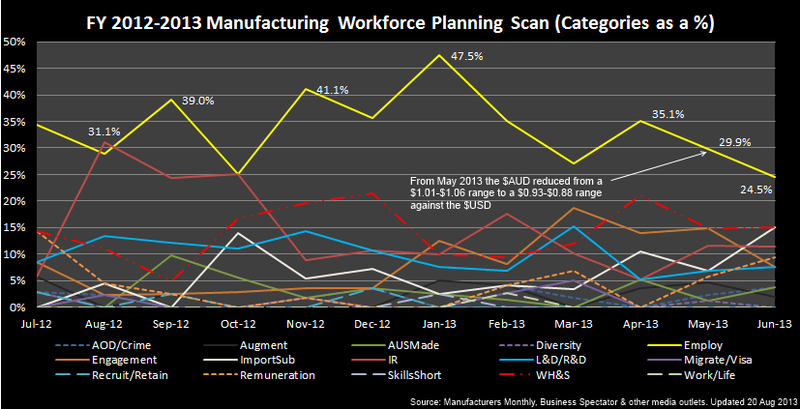 If you are interested in other sector analysis my recent Mining Workforce Planning Scan can be found at Random Analytics: Mining Workforce Planning Scan (July 2013). Back in February 2011, at the height of the Arab Spring, I wrote a blog about Egypt which received a lot of criticism at the time. With the passage of time however it seems that my worst fears are now becoming reality. Here is the original piece (20 Feb 2011) titled Egypt: It’s about the Economy and Work, not Democracy via HR.com. I have a vivid memory of my final year at university. I was giving a review on Dr Michel Aung-Thwin’s work “Parochial universalism, democracy Jihad and the orientalist image of Burma: The new evangelism” and was rounding up the argument that without security first democracy cannot work, especially in the Asian context. At the end of my presentation one of my fellow students jumped up from his seat and said forcefully that I had ‘crapped on the ideals of democracy and I was a disgrace to the university’. He subsequently stormed out of the lecture room without giving me a right of reply and I went on to get a high distinction in the subject. Dr Michel Aung-Thwin argued that without economic and physical security you cannot have democracy, or at least a democracy that will last over the longer term. His work in relation to Burma in the early part of the previous decade is relevant to the issues facing the Middle East and Northern Africa today. The crisis gripping that region, commencing in Tunisia and Egypt but now impacting other states such as Libya, Yemen and Bahrain is more about the economy than it is about democracy. In Egypt the population wants a rapid normalisation but after a month of protests, a significant loss of foreign income (reportedly $300M USD per day) and a military Junta in place, at least until September this is unlikely. A week after the democracy protests ended there are now protests in relation to pay and conditions and many of the key elements of the economy are closed, including financial institutions and many businesses. The Global Financial Crisis has hit Egypt hard and rising inflation, especially rising food prices are hurting the poorest first. The median age (that is the age at which half the population is older and half is younger) for the West is approximately 40 (Australia has a median age of 36.9 while in Japan that rises to 44.6). Due to a 3 – 4% population growth in the Middle East and North Africa the median age is much lower. In Tunisia that corresponds to 29, Egypt 24, the West Bank and Gaza 20 and in Yemen just 17. In Saudi Arabia, a rich country that imports most of its working population from the poorest regions of the world around 70% of the population is sub-30. In Egypt 80% of the population with an age of 29 or less are unemployed. Gender disparity, an issue common to the region is also worrying with only 18% of women out of university finding employment, while for men the rate is 50%. Recently the International Labour Organisations estimated that the Middle East and North Africa region alone would require 100,000,000 million new jobs to fulfil the requirements of the new entries coming into the system by 2020! Workforce Development is also an issue. Egypt has an education system which is poorly staffed (teachers in the Middle East are poorly remunerated and trained), poorly maintained with aging infrastructure and legacy curricula but heavily attended. For those who can afford to get a university education in Egypt they then have issues finding employment. Dr Hassan Hakimian, the Director of the London Middle East Institute recently discussed the fact that is takes a university graduate up to 15-years on average to enter the state or public sector. If you consider this from a Workforce Planning perspective then someone who has worked in a sector or industry for 15 to 20-years in the West would be considered mid-career and perhaps looking to move on to something else or moving up into a higher level of management. In the Middle East and North Africa it may just take this long to get into the system and this will have ‘lag-effect’ issues. One obvious ‘lag-effect’ will be the best and brightest in Egypt and other parts of the region will look to the West for employment opportunities. Why wait until 2026 for a job? Egypt has a long history of expelling Pharaoh’s from power that couldn’t provide sustainable conditions for the population. Mubarak and his aging cohorts in Egypt are just another dictatorial link in that chain. The challenge, initially for the Junta but over the longer term for any democratically elected government in Egypt will be to normalise the economy and to get people working again. If they don’t then the issues facing the region will be far graver than what we are currently witnessing. As confronting as these statistics are the data has not improved over the past 30-months. There is no doubt that the Egyptian military (a significant business entity in its own right), followed by the democratically elected government of Mohamed Morsi and in recent months the interim government post overthrow have not been up to the challenge of improving the economy and getting Egyptians working again. 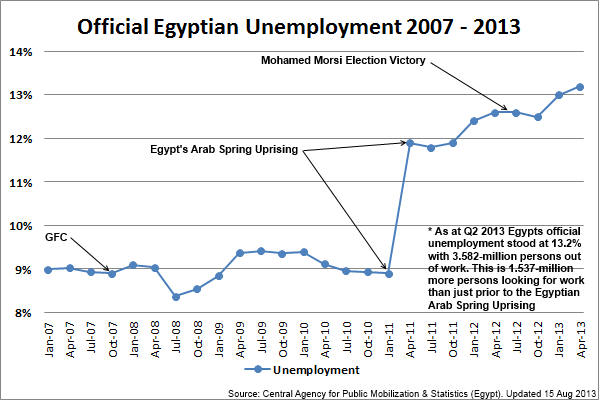 To emphasise this point here is a look at the official Egyptian unemployment data since 2007. It should be noted that the Central Agency for Public Mobilization & Statistics only counts those ‘individuals who are actively looking for a job but cannot find work’. Given the facts that I presented in early 2011 I would guess that the participation rate in Egypt is staggeringly high, yet official movements in unemployment are still very good indicators of the health on any economy. I’m not a country specific specialist (outside of Australia of course) but I am a Workforce Planning specialist and the facts that I stated in 2011 have not changed. In fact I would suggest with the continued political instability the situation that I described back then with a further 1.5-million Egyptians looking for work and unable to find it is now worse. With the very real possibility of Egypt on the brink of large scale violence, even civil war the situation is no longer just grave. On the 25th October I posted a blog titled “Romney’s Promise” which detailed some of the history and issues around one of the Republicans key election objectives, that is in their first term they would create 4-million new jobs for Americans. Now I’m all for job creation and the sentiment behind this statement is a positive projection from the leader of opposition but there are a number of issues here, no matter who forms the next Australian government. 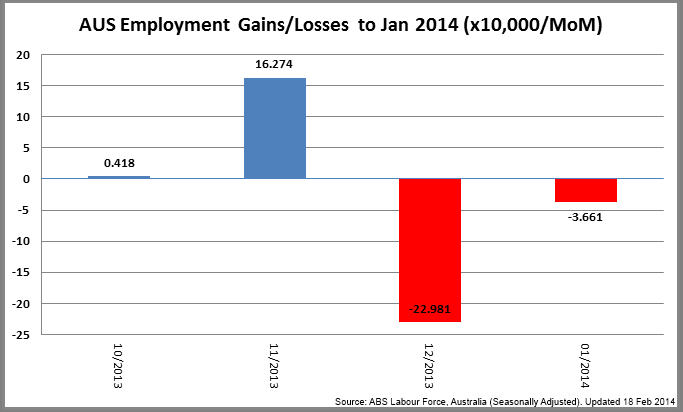 Figure 1: Australian Employment gains & losses by month. Data sourced from the Australian Bureau of Statistics. The first point I would like to make is the outstanding jobs creation journey that Australia has been on since the ABS commenced capturing the data and making it accessible to the public. 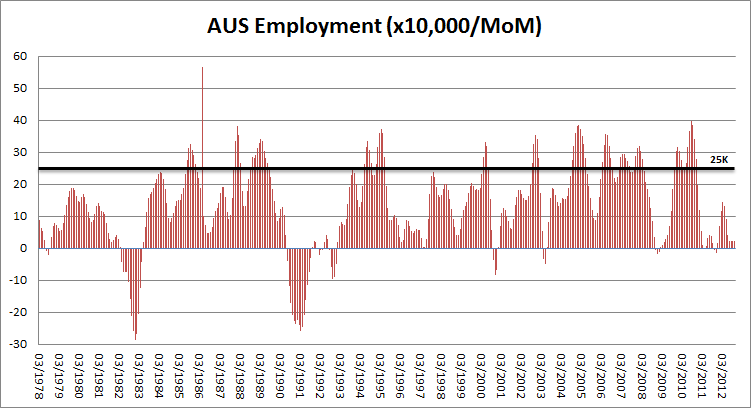 Of the 416 available months of data only 51 months (12.26%) has reflected an overall employment loss, month-on-month. In fact if you look at Figure 1 you will see that since January 1993 we have actually only had 11-months of negative employment (or just 4.62%). For Tony Abbott to realise his goal of creating 1,000,000 new jobs in just five years he would first need to serve two back-to-back terms. He would then need to create more than 16,700-jobs per month. If he wanted to do this in one complete term he would need to serve the maximum time (three years and 140-days) which would equate to a job creation program of 25,000 persons in any form of employment per month consecutively over 40-months. Continuing to look at the data contained in Figure 1 this would be a historic feat. In the past 35-years (or to be exact 416-months) the Australian economy has only ever put on more than 25,000-jobs in a month 82-times (19.71%) and only lost more than 25,000-jobs on 4-occassions (0.96%). The last time we were negative by that amount was March 1991! The longest consecutive gain of more than 25,000-jobs per month were in Sep 1988 – Jul 1989 (11-months and 328,000 jobs) while the most recent was May to Nov 2010 (7-months and 235,000 jobs). But Tony Abbott didn’t state he wanted to create 1-million jobs in just five years, he actually wants to create 2-million jobs over ten years. So who is he creating these jobs for? Figure 2: Australian Unemployment 1978 – 2012. Data sourced from the Australian Bureau of Statistics. Well, it’s not for the unemployed. As shown in Figure 2, we currently only have 652,700 people looking for some form of work at the moment. At the height of the mining boom in March 2008 there were just 465,800 people looking for work and at our worst point in September 1993 around 946,900 of us were looking for a job. Even if a new Coalition government could employ every currently unemployed person in this country he would still need to fill the 1.35-million new jobs that he wants to create. Where would he find these numbers? The answer lies in the Australian working population figures. Figure 3: Australia’s working population (15 – 67 years of age). Data sourced from the Australian Bureau of Statistics. 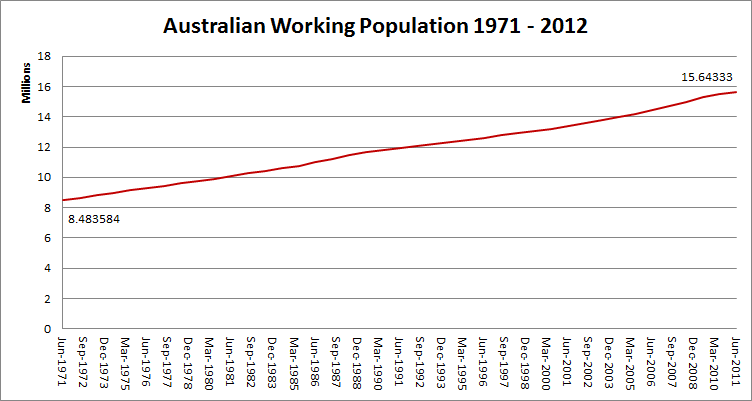 In the past 40-years Australia’s working population has increased from 8.48-million to 15.64-million. Traditionalists would only include the 15-65 year age cohort but since our superannuation system is moving officially to the 67-year figure by 2018 I’ve included the extra 396,082 estimated people of that age in my count. The Rudd/Gillard governments were elected from September 2007 and during their tenure they have added 870,400 jobs to the economy. What they will not say is that over the past 40-years the Australian economy has required, on average, an extra 179,000 new jobs created to employ all of the new entrants into the workforce. So, for the Rudd/Gillard governments to have actually increased the amount of working people in Australia, they would have needed to actually create 895,000 new jobs plus one. So for Tony Abbot to meet his figure and create new jobs he would need to add 16,667 new roles to meet his promise while also adding 14,916 to keep up with the average amount of new entrants into the workforce. But Tony didn’t say ‘new’ jobs did he. He said ‘jobs’. Given that he would first need to find 1,790,000 jobs for new entrants during his first 10-years in power he is only left having to then create 210,000 ‘new’ jobs to decrease the numbers of either unemployed (currently at 652,700) or non-participatory segments of the community. With an Australian participation rate of just 65.1% this would be a potential 7.8-million people you could look to assist back to employment. For those of you who work in this difficult policy area, a much easier thing to say than to accomplish. In reality the creation of 1-million “new” jobs over the next two parliaments would be almost an impossible figure to achieve. Looking at the history this target has just never been achieved and as the Rudd/Gillard figures demonstrate creating 870,400-jobs during the Global Financial Crisis, although an excellent result compared to other countries such as Greece, did not even keep up with the demand from new entrants let alone increase the overall capacity of all Australians to be employed. Looking at what both sides of politics say about job creation just shows that by being a little bit tricky in language you can say almost anything about job creation because the subject is complex. Robert McNamara summed it up much better than I when he wrote in One Hundred Countries, Two Billion People (1974) “A treadmill economy tends to emerge, in which the total national effort will exhaust itself by running faster and faster merely to stand still”. Update 1 (5/12/2012): Greg Jericho (aka @grogsgamut) added a very detailed piece of analysis titled “A million new jobs ain’t what it used to be” via his weekly ABC The Drum blog. It’s good work and definitely worth taking a look at. I had an interesting discussion today about Australia’s recent increase in its official unemployment rate which rose to 5.4% (seasonally adjusted). That percentile equates to 662,700 unemployed persons. It has been my consistent view that the current unemployment and participation rate data is softened by factors such as seasonal adjustment and under-reporting. My point here is that the real unreported figure could be higher due to severance economy issues and as Australia transitions from an overall boom economy to, at best, a more globally normalised economy. Rather than focus on that rather negative sentiment I thought it might be useful to have a look at some global data to get a sense of perspective. Here is a look at the official (seasonally adjusted) unemployment figures for Australia, the USA, UK, Spain & Greece. 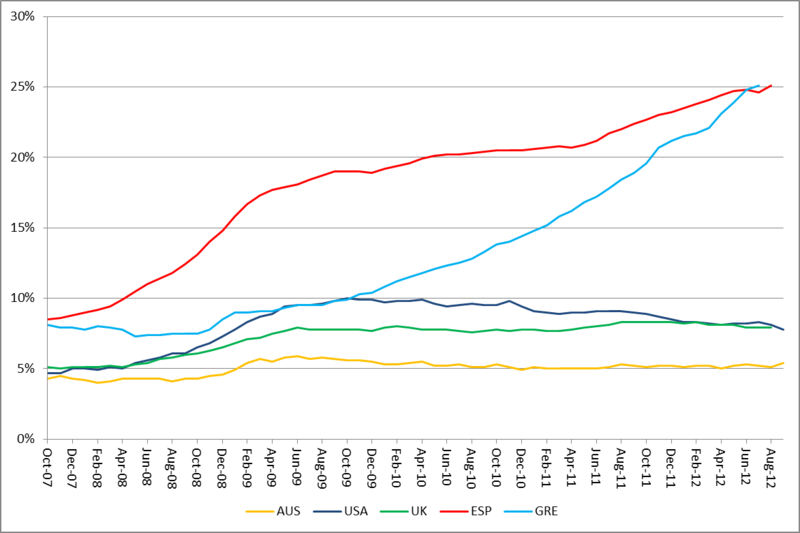 Figure 1: Unemployment (seasonally adjusted) for Australia, USA, UK, Spain & Greece. Data sourced from the ABS, BLS, ONS & EuroStat. That gold line which has trended under or around 5% for the entirety of the Global Financial Crisis is Australia. For the other countries represented in the graph the last five years have been dark days indeed. The US (dark blue), still the world’s largest economy has an official unemployment figure of 7.8% (or 12.1-million persons). The UK (in green) sits at 7.9% (2.57-million) trending at 8% or thereabouts since mid-2009. Then there are the current horror stories of Greece & Spain, both of which now have official Euro high unemployment figures of 25.1%. For Spain there are 5.77-million and Greece 1.26-million unemployed, a total of 7.03 million unemployed for both countries. Put in context this equals more than 60% of the total current Australian Labour force. So things might not be great in Australia at the moment as we see layoffs across some sectors of the economy and our official unemployment figures nudge up. I’m happy to bet that you would still rather be in Australia with this economy than in Greece or Spain with their economies?